The PA German Hanging Cupboard in the sidebar is a reproduction of a cupboard housed at the Winterthur Museum. 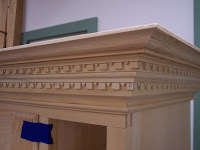 I learned how to make this cupboard in a class taught by Gene Landon at Olde Mill Cabinet Shoppe. The most impressive part of the cupboard is the crown moulding and I think, specifically, the dentil moulding. When those of us taking Gene's class first saw his reproduction, we gasped. And I thought, "How the heck did he figure that out?" 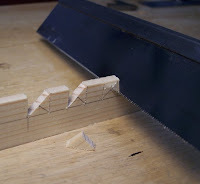 Making the dentil moulding is surprisingly simple. At left are progress shots o f the layout and the series of saw cuts. Each tooth is 3/8" square. The pointed part of the tooth is half the height and width of each square and is created by cutting a 45 degree angle from the top two corners of each tooth. 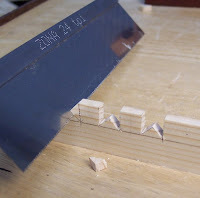 I used a 24 tpi Zona saw, but you can use a scroll saw or coping saw or whatever you like, just so it makes a fine cut. 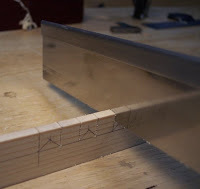 Touch up saw cuts with a small chisel, if necessary. That's all there is to it! Some clever 18th c. carpenter figured that out and made one impressive kitchen cupboard.